Patches are back, I think we all noticed it. My favourite way to wear patches is still on jeans, which is why I'm currently DIYing my own pair. However there are many brands out there who sell awesome patch jeans. It probably all started with the Zoe Karssen pair above, but some good budget versions should be available by now. As the pants are the statement piece in this look, I decided to keep the rest simple with cosy sneakers and the good old striped shirt. Those who follow me on social media know that this look is inspired by my latest H&M order. Unfortunately the top didn't suit me so I sent it back, but I think it would have been a great match for my granny shoes. Especially when combined with a denim A-line skirt to keep the 70s vibes going on this summer. As the title of this post says outfit combinations to try this weekend, I obviously also had to add a Coachella inspired look. The world known festival will take place this weekend and I'm sure every girl there will have at least one of the above pieces with her. 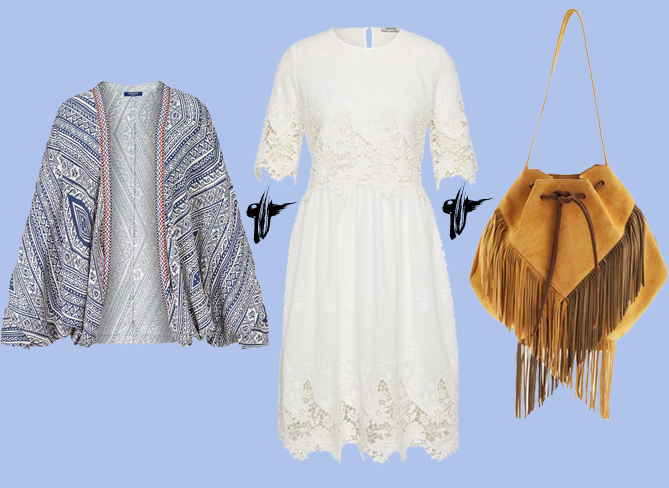 So why don't you get in the festival mood, too with a matching outfit? Which of these combinations are you going to give a try this week?